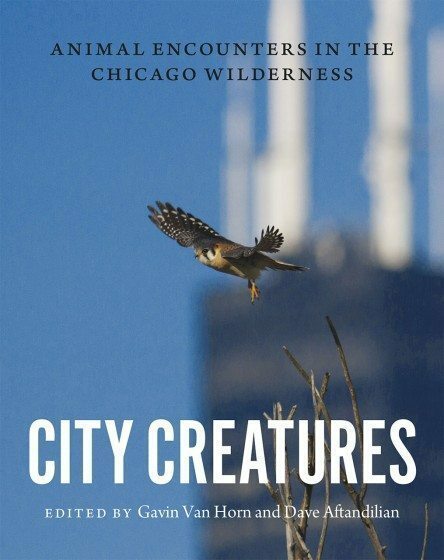 A review of City Creatures: Animal Encounters in the Chicago Wilderness, edited by Gavin Van Horn and Dave Aftandilian. 2015. ISBN: 978-0-226-19289-5. University of Chicago Press. 377 pages. Buy the book. Normally, in these book reviews, I do my best to present a fair, unbiased account of what a book does well, as well as what it doesn’t do so well. However, in this case, I want only to tell you how INCREDIBLE this book is. A collection of stories, poems, drawings, and photographs contributed by numerous Chicago artists, scientists, and residents, it whisks the reader through the streets, parks, and history of the Chicago region, giving a perspective on the city’s relationship with nature that is at once complete, nuanced, detailed, entertaining, and surprisingly intimate. Urban development has had profound impacts on nature in Chicago, but the interesting story is of the opposite interaction: how nature has influenced the people. The first contribution, “Keeping Chickens,” by Terra Brockman, provides a glimpse into a schoolyard chicken-keeping program. Many people may not consider chickens to be wildlife, or a schoolyard to be wilderness, but the book isn’t really about either of those things. “City Creatures” is really about relationships. In an urban setting like Chicago, the most influential participants in any relationship are almost undoubtedly people, and the real surprise and delight of “City Creatures” is just how human it is. 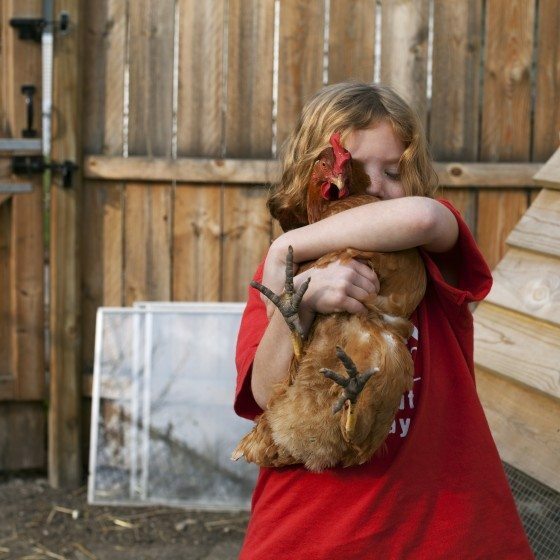 Colleen Plumb, Holding Backyard Chicken, photograph (2012). There are a few contributions that focus mainly on plants and animals, such as Stan Gehrt’s portrait of Chicago’s coyotes, which he has dedicated his life to studying. But most of the stories in “City Creatures” focus on how humans and nature have interacted, and are still interacting, to make Chicago what it is today. Someone with a more detailed knowledge of, and experience with, Chicago could speak better to this, but the book gives a fascinating historical perspective on how the landscape of the Chicago region has been altered by human activities. The Chicago region was, and still is, one of the most biodiverse areas in North America, owing to its proximity to both Lake Michigan and to tallgrass prairie habitat, as well as its role as a migration stopover point for innumerable migratory birds. Urban development has had profound impacts on all of these, but the really interesting story is of the opposite interaction: how nature has influenced the people of the Chicago area. Chicago’s history as an area rich in biodiversity has inspired a sentiment of stewardship into the area’s culture. “City Creatures” provides numerous examples of this ethic in practice throughout Chicago’s urban wilderness. From the restoration of Bubbly Creek (“Canoeing through History: Wild Encounters on Bubbly Creek,” by Michael Bryson) to the creation of a natural classroom outside the American Indian Center (“Kiskinwahamâtowin [Learning Together]: Outdoor Classrooms and Prairie Restoration at the American Indian Center of Chicago,” by Eli Suzokovich) to people volunteering their early mornings to find unfortunate migratory birds that have fallen to the streets after striking one of Chicago’s many skyscrapers (“Migration: A Bird’s and Birder’s Eye View” by Joel Greenberg), inspiring stories of people caring for nature abound. A particularly hopeful note comes from the story of the Prairie White-fringed Orchid, a severely endangered plant found in one of Chicago’s parks by a young Latino college graduate. The population sometimes was as low as four individuals, and in some years no orchids were found. However, through the dedicated efforts of scientists and volunteers, the orchid has made a comeback and the population now numbers in the hundreds or thousands. As mentioned before, though, not all the stories are about animals that might normally be considered “wild.” One story that hit me especially hard was “Falling Apart,” by Tom Montgomery Fate. It is a heartbreaking sketch of a family in a time of crisis: their beloved cat, Rosie, is dying. At the same time, a family friend passes away, family member is hospitalized, and a nephew is born. It is the family’s love for Rosie, and their grief at her passing, that keeps them together through this emotional tug-of-war. It is an intimate, heartrending glimpse into a raw emotional state, so beautifully written I can’t possibly do it justice here. I mention this story not to bum you out, but instead to illustrate the wondrous range and scope of “City Creatures,” and to demonstrate its aforementioned ‘human’-ness. “City Creatures” is expertly and elegantly written, edited, and arranged. The skill and knowledge of the contributing authors and artists are marble of the highest quality, but editors Gavin van Horn and Dave Aftandilian are the Michelangelos who saw and brought forth a David. I had the pleasure of hearing Gavin speak at the 2015 Urban Wildlife Conference in, probably not coincidentally, Chicago. From that talk, I knew immediately that this was a special project, and regret that it took me this long to get a chance to read “City Creatures.” One aspect of Gavin and Dave’s work I highly value is the noticeable and enriching diversity of perspectives they have included. The voices of women and minorities are indispensable here, as they are elsewhere. I truly hope that the richness and depth they provide here can be emulated in other arenas. Cannon Dill and Brett Flanigan, Fox, part of the Art in Public Places project, aerosol and latex paint on concrete (2013); photograph by Joseph Kayne. The other lesson to be taken from “City Creatures” is about Chicago itself. At nearly ten million inhabitants, it is one of the largest urban agglomerations in the country and, indeed, in the world. Nevertheless, here we have proof that wilderness and nature not only survive, but thrive in the metropolis. Perhaps we don’t necessarily need to sacrifice our connection with nature in order to live in a thriving city—Chicago illustrates how the two can coexist. Surely, incorporating some of these lessons into our other growing cities will be valuable, not only for the various associated health, psychological and ecosystem benefits, but also so that, someday, even the most urban of dwellers may have a story to tell about the city creatures of their neighborhood. Stories like these help bring us together and foster a sense of community, which can, in turn, have effects beyond experiencing nature, like getting groups together to tackle social justice issues. Connecting with nature improves lives, and makes cities better places to make lives. 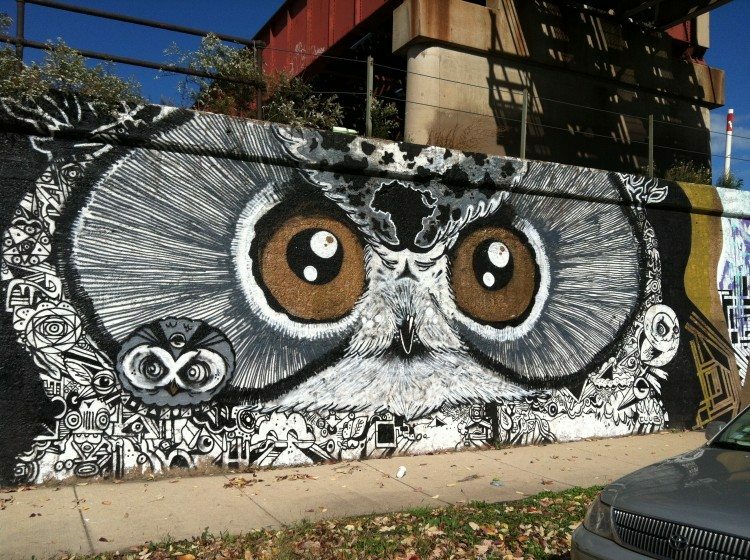 Brooks Blair Golden, Owl, part of the Art in Public Places project, acrylic and spray paint on concrete (2012); photograph by Lisa Roberts. “City Creatures” is a must-read. I don’t attach any qualifiers, like ‘for anyone interested in urban wildlife,’ because I don’t believe they’re necessary. “City Creatures” is not only one of the best books about urban wildlife I’ve ever read, it’s one of the best books I’ve ever read. I’m sure it will remain on my bookshelf for years and years to come, and obtain ever more creases and signs of love as I read and reread its pages. You can support TNOC (and the book’s authors) by buying the book via this link. 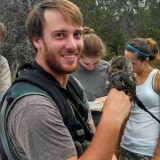 Chris is a MS student at California State University, Fresno studying the socioecological dynamics of cities. He has also contributed in various fieldwork projects across the United States. At the the bottom of the review there is a link to Amazon.com. Buying the book via this link gets TNOC a small commission. We don’t sell the book directly.